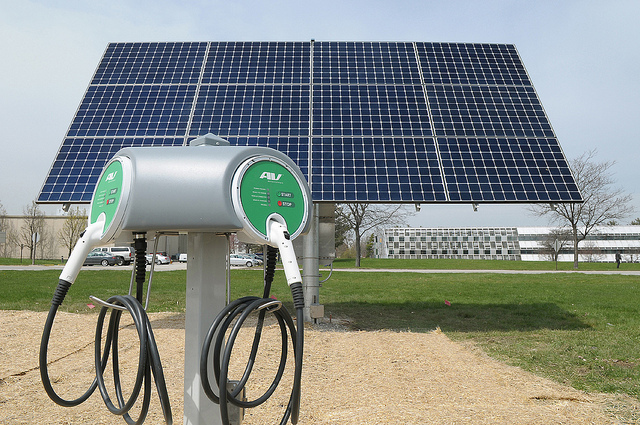 Current technology-forcing policies imply that wind/solar power combined with battery electric vehicles represent our only viable energy future. Given the fundamental limitations of these technologies, this is a very dangerous notion. The costs of forcing deployment of these technologies can be especially high in developing nations. A shift to technology-neutral policies is sorely needed. It is undeniable that wind/solar power and battery electric vehicles (BEVs) will play an important role in the energy system of the future. They are, however, fundamentally limited regarding the speed and extent to which they can grow. Despite these fundamental limits, current policy frameworks imply that they are essentially our only options for a clean energy future – a very dangerous notion indeed. This article will discuss the dangers associated with current green technology-forcing in more detail, outlining why it can easily hurt much more than it helps. A follow-up article will then detail some of the other options at our disposal together with some musings about how these options will respond in a more intelligent technology-neutral policy scenario. Before we start, here is a quick clarification on what I mean by technology-forcing and technology-neutral policies. Technology-forcing promotes certain technologies over others through mechanisms like subsidies, tax-breaks, mandates, portfolio standards, low-interest financing, accelerated depreciation, guaranteed prices, etc. Technology-neutral policies target the real issue and alter the competitive landscape in favor of any technology that can address this issue. Examples include a carbon tax to combat climate change, fuel taxes to limit congestion and oil dependence, and vehicle/plant emissions taxes to improve air quality. Let’s start by revisiting the fundamental limits to the growth of wind, solar and BEV technology. If these limits did not exist and there really could be a tipping point beyond which these green technologies would mercilessly sweep aside fossil fuels for good, I’d be all for it. But unfortunately, this is not the case. Their variable and non-dispatchable nature that leads to sharp value declines and a perpetual subsidy dependence. The poor correlation between wind/solar resource availability and population density. The fact that they only supply electricity, which currently accounts for only 22% of final energy demand. 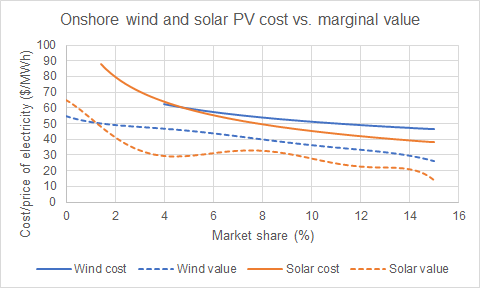 Cost and value decline of wind and solar power. As a practical illustration of the growth limitations faced by wind and solar power, the graph below compares primary energy growth in China. 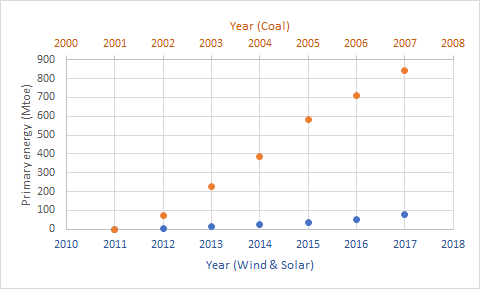 Clearly, despite massive technology-forcing, combined wind and solar output is increasing at about a 10x slower rate than coal grew a decade earlier. This large difference is even more striking when considering that the productive capacity of the Chinese economy was almost 3x smaller during the coal growth period than the wind/solar growth period. It is also noteworthy that grid integration issues are already hampering wind/solar scale-up even at the current low market share, whereas pollution concerns of coal started limiting deployment at much higher market shares. Data (1, 2) showing China’s impressive recent wind & solar scale-up relative to coal growth from a decade earlier. The most suitable market segment, passenger light duty vehicles, represents only about 21% of global oil consumption and 7% of fossil fuel CO2 emissions. Even within this segment, economic attractiveness fades quickly for longer-distance highway driving applications. Unless a new battery technology emerges, technology metal availability will pose serious scale-up constraints. 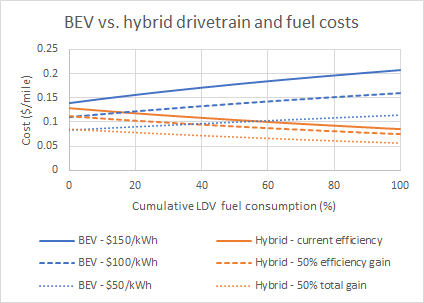 Drivetrain and fuel costs for BEVs and hybrids employing assumptions consistent with commuter cars on the left and highway cars on the right of the graph (previous article). However, the most important issue to me is the fact that all of these green technologies are highly capital intensive. Furthermore, commitment to an energy future dominated by these technologies also demands a wide range of complex and capital-intensive supporting investments. This complex front-heavy investment requirement makes these technologies fundamentally unsuitable for supporting rapid economic development, which is a much higher priority than sustainability for about 80% of global citizens. 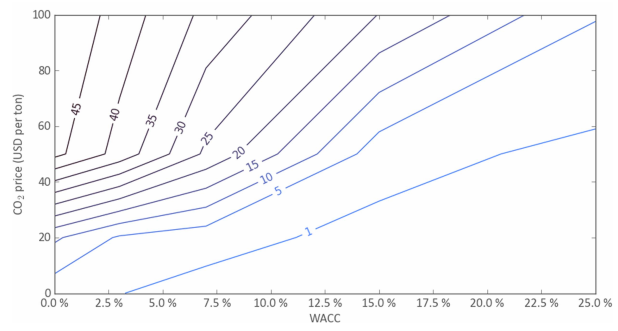 Contour lines showing the welfare-optimized wind/solar market share under different discount rates (WACC) and CO2 prices (discussed in detail earlier). 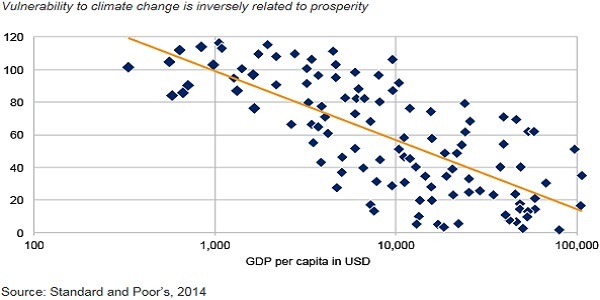 Developing nations will generally fall towards the bottom-right of the graph. Firstly, the policy-driven growth of these technologies attracts a lot of capital and initiative that would have gone to the myriad of alternative sustainability options under a technology-neutral framework. Given the typical multi-decade development pathway from concept to fully cost optimized commercial scale deployment, putting all of our eggs in one basket is a very risky ploy. Solar PV illustrates the time required to go from concept to commercial reality (image source). Secondly, the enormous supporting infrastructure buildouts required by this pathway will impose a massive cost if things don’t work out as expected. For example, getting anywhere close to 20% of our final energy from wind and solar will require a total redesign of the power system with heavy investments in flexible power plants, long distance transmission lines, demand response and energy storage. If we eventually realize that the required deep decarbonization is not possible through this pathway, switching to an alternative pathway will be incredibly costly (both in terms of time and money). 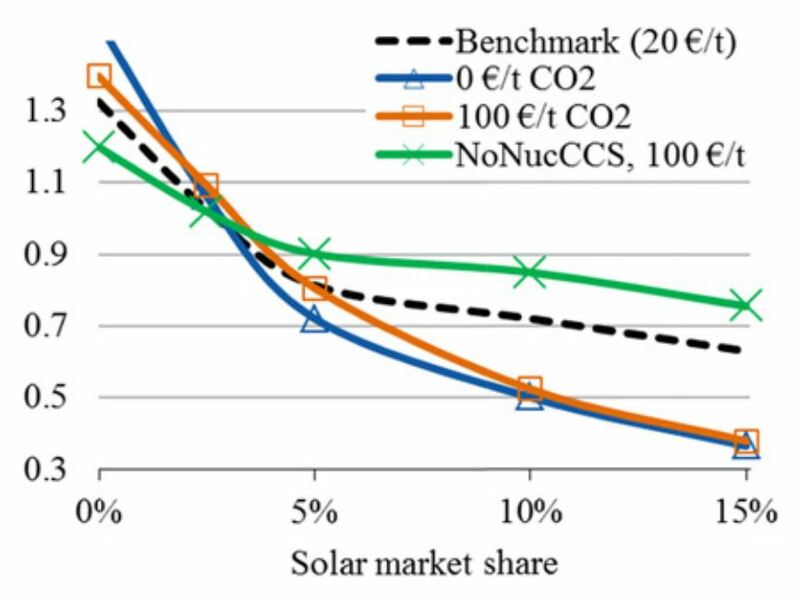 Large value declines of solar PV in a high carbon tax scenario when changing from policies excluding nuclear and CCS (green line) to policies including all options (orange line). Thirdly, forced deployment of these capital-heavy technologies at a scale that will actually make a difference will divert unacceptable amounts of capital away from other infrastructure investments capable of stimulating compounding economic development in the developing world. Such development is critical to increase life expectancy and quality of life, and impeding this development can have massive humanitarian costs (below). As a quantitative illustration, I previously estimated the net cost of this effect at $750/ton of CO2 avoided. An important omission from the enormous cost mentioned above is that rapid economic development directly shields people against the effects of climate change. Improved housing, sanitation, utilities, medical care, international trade connections and general productivity will all greatly reduce the impacts of a more hostile climate on the lives of developing world citizens. Ironically therefore, CO2 released to maximize the speed of this massive infrastructure buildout will actually lower the climate impacts experienced by the majority of global citizens. Economic development offers excellent protection against climate change (image source). Finally, we should acknowledge that rapid increases in global productivity will make it much easier to balance our carbon budget by the end of this century. As a simple example, it is now finally becoming more generally accepted that broad deployment of carbon negative technologies will be required to achieve our climate goals. Let’s consider a worst-case scenario where we eventually need to extract a massive 2000 Gt of CO2 from the atmosphere via bio-CCS, direct air capture and reforestation at a high average cost of $150/ton. Currently, the enormous total cost of $300 trillion is more than double global GDP (PPP). However, if we can bring the developing world up to developed world productivity, the total cost suddenly reduces to less than 6 months of global production (1% of output spread over 50 years) – certainly a manageable number if we consider what is at stake. 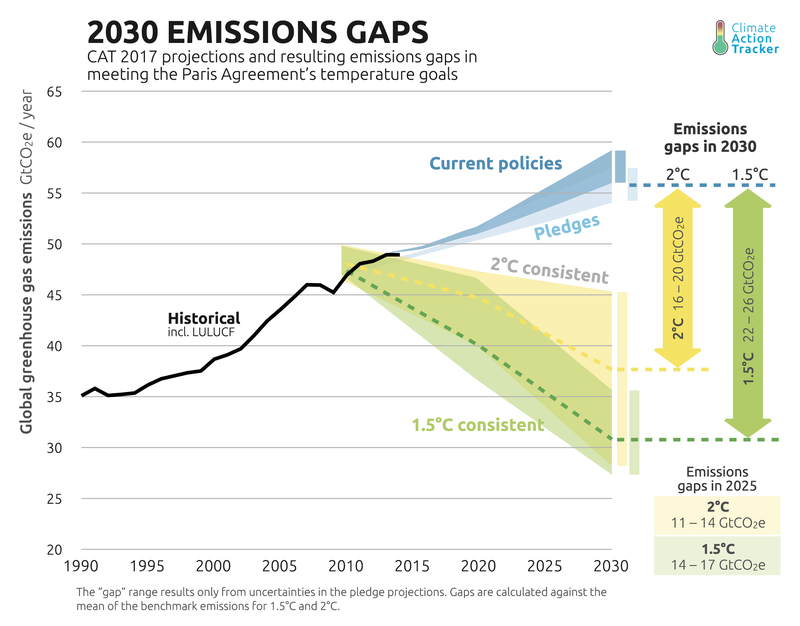 Illustration of rapidly growing emission gaps that will enforce carbon negative solutions later this century. 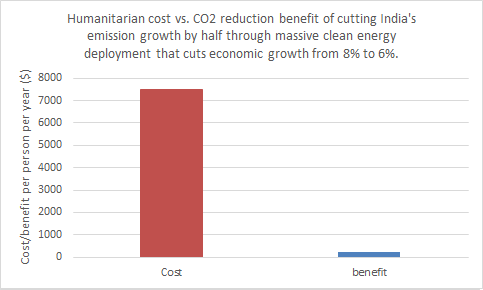 Thus, any economically inefficient decarbonization effort in the developing world will result in a broad range of costs totaling far more than the $750/ton CO2 estimate given above. And yes, technology-forcing is per definition economically inefficient. Technology-forcing policies promoting wind/solar power and BEVs may do much more harm than good in the long term. This is especially true for the developing world where about 90% of economic and energy growth will take place over coming decades. It is crucial that people concerned about our great 21st century sustainability challenge stop bickering about which technology class is best. This time and initiative can be invested much more productively in advocacy for technology-neutral policies leveling the playing field for all clean energy technologies. Such policies will unleash a broad range of creative sustainability solutions, some of which will be covered in the second part of this article. Given the urgency and magnitude of our global sustainability challenge, we can no longer afford to persist with inefficient technology-forcing of the most ideologically attractive solutions.